The Stonewall Foundation is committed to addressing its purpose by supporting and cultivating young LGBTQ+ leaders to better assure that our youth have meaningful, safe, and joyful futures. 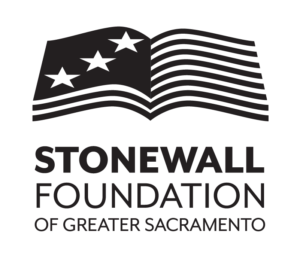 We have taken a step in that direction by creating an internship for one high school student at the Sacramento LGBT Community Center through the Sacramento Mayor’s 1000 Strong Initiative. Stonewall Foundation board members attended the Elk Grove Unified School District board meeting on Feb. 5, with Vice Chair Dharia McGrew and former Treasurer Jeff Edwards speaking in support of adopting a new curriculum that includes LGBTQ leaders in textbooks. We were pleased to witness a unanimous Board decision to approve new teaching tools that reflect a more accurate representation of so many individuals and their families in our community. We applaud the study of such diversity as it brings a welcome range of role models to students. The new materials align with the California History/Social Science Framework related to the Fair, Accurate, Inclusive and Respectful (FAIR) Act. Tatiana Gomes, a high school intern working with the Stonewall Foundation and the LGBT Community Center, offers their personal and most powerful point of view. As a Person of Color and a member of the LGBTQ community representation is extremely important so when EGUSD started reviewing textbooks that would accurately portray the roles and contributions of People of Color, LGBTQ people and persons with disabilities I started to reflect on my own view of the world. I've always understood that I'm extremely lucky when it comes to the people I was surrounded by when I was younger, but the lesson didn’t click until now. My grandfather was an African-American man who grew up during Segregation in South Carolina. It was because of the hardships he encountered in South Carolina that he chose at fifteen years old to join the military to fight in the Korean War in the Air Force and then subsequently serve three tours in Vietnam with the Navy; he was also in the first wave of African-American servicemen to be allowed into Technical school when the U.S. Military was desegregated. My grandfather served his country proudly even if the people didn't believe he was equal because of his skin color. Ever since I was born, I was taught that being gay or LGBT was normal. I have been a part of the LGBT community since I could understand what being gay meant. My Aunt played a big factor in that, she’s been with her partner for about 30 years and they have been important role models for me. My Aunt has two masters and she has worked in several companies in Silicon Valley and her partner has a PhD in Microbiology and she served in the first Gulf War as the National Guard. They were the ones who taught me I could have a normal life despite being LGBTQ. It was because of them I’ve never had to worry about whether or not I could live a normal life, have a good career, or if it was okay for me to be this way. I’ve never had to worry about being accepted by my family, I’m one of the lucky ones. Many other children didn’t have the luxury I was afforded. Some come from families that just don’t understand while others have families who are openly hostile to the LGBTQ community. For the people who don’t have someone like my aunts discovering who they are can be confusing, lonely, and scary. That’s why LGBTQ+ representation in school text books and media is so important because it’s for the people who don’t have someone like my Aunts to look up to, to understand that it’s okay to be who you are.